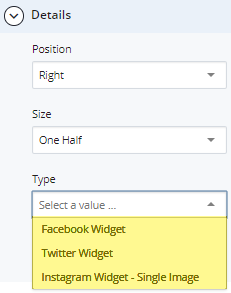 Use Twitter, Facebook, and Instagram widgets to display social media in real-time feeds. Expand to Section > Chunk. In the drop-down menu for Type, select Social Media. 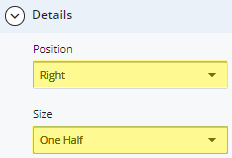 Select the Position and Size. Under Type, choose Facebook Widget, Instagram Widget - Single Image, or Twitter Widget. 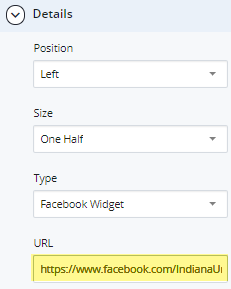 For the Facebook Widget, enter the URL of the Facebook page. To save a draft, click Save & Preview. Submit the page to apply your changes. Publish the page. For Twitter Widget, enter the Twitter URL. Creating a Twitter widget is no longer required. If you have a Widget ID field on your site, you can leave it blank. 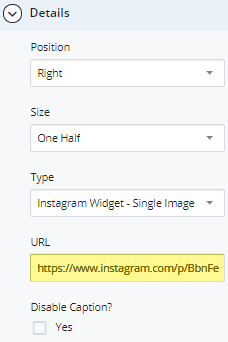 ﻿For Instagram Widget - Single Image, select the image to add and copy the URL as shown below. Note: The Instagram image will not display in the WCMS. 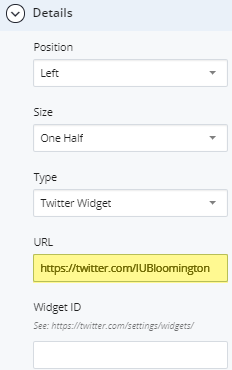 Enter the copied URL into the URL Field. Check the box for Disable Caption if necessary.